I have had an annoying issues at two customer sites now, and I want to share the solution with you. 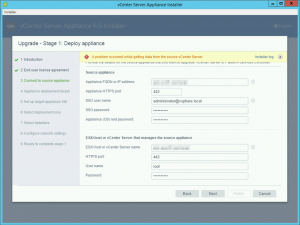 The problem is that you cannot VMotion VMs to a newly installed ESXi 6.5 hosts running on Lenovo SR650 hardware. The CPU used in the new host is Intel Xeon Gold 6154 Processor, and the old hosts are using Intel Xeon Processor E7-4880 v2. I do not think that the source CPU model is relevant to the issue it could be any supported Intel CPU in the same cpu family. If possible, use a cluster with Enhanced vMotion Compatibility (EVC) enabled; see KB article 1003212. CPUID details: incompatibility at level 0x1 register 'ecx'. 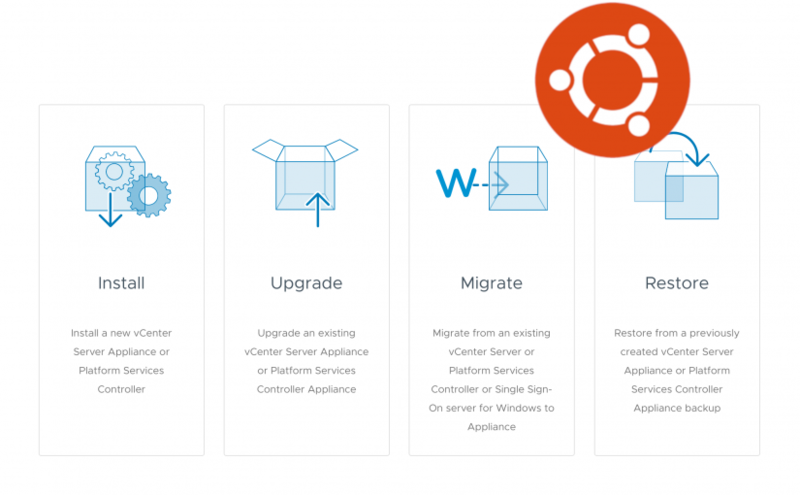 The host's CPU hardware should support the cluster's current Enhanced vMotion Compatibility mode, but some of the necessary CPU features are missing from the host. Check the host's BIOS configuration to ensure that no necessary features are disabled (such as XD, VT, AES, or PCLMULQDQ for Intel, or NX for AMD). For more information, see KB article 1003212. After upgrading VCSA from version 6.5 to 6.5 Update 1 you might experience a problem with Task Names and object Descriptions. Names are not “resolved” to its human understandable name, but instead they are written as a API object name. 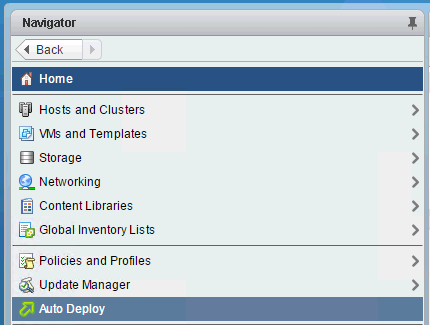 I have had an annoying issue in the vSphere 6.5 Web Client, where Auto Deploy would not show up in the left side menu. Are you looking to Upgrade Mirage and move it to a new server, or are you just looking to move Horizon Mirage to a new server, this article will describe what you need to do. 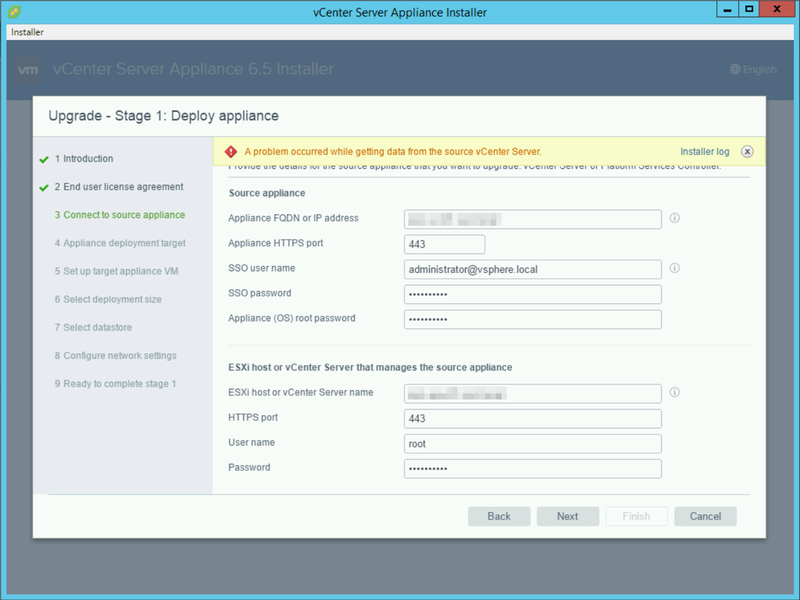 I just upgraded the vCenter in my test lab, and I got an error after the first part of the process. When it was about to migrate data from the old VCSA 6.0 Server. 2016-11-16T16:42:03.784Z - debug: initiateFileTransferFromGuest error: ServerFaultCode: A general system error occurred: vix error codes = (1, 4294967294). 2016-11-16T16:42:03.785Z - debug: Failed to get fileTransferInfo:ServerFaultCode: A general system error occurred: vix error codes = (1, 4294967294). 2016-11-16T16:42:03.785Z - debug: Failed to get url of file in guest vm:ServerFaultCode: A general system error occurred: vix error codes = (1, 4294967294). 2016-11-16T16:42:03.785Z - error: Error in getting fileData for nodeType. Error: ServerFaultCode: A general system error occurred: vix error codes = (1, 4294967294). 2016-11-16T16:42:03.785Z - error: Failed to read the nodetype, Error: A general system error occurred: vix error codes = (1, 4294967294). 2016-11-16T16:42:03.786Z - error: sourcePrecheck: error in getting source Info: ServerFaultCode: A general system error occurred: vix error codes = (1, 4294967294). I quickly discovered the reason. My root password was expired and it wanted me to create a new password for root.